HYATT REGENCY NEW ORLEANS / October 3-5, 2019 / www.orexcellence.com CONFERENCE PREVIEW • Controversies in Infection Control • 25 Ways to Improve Your Patient Experience Scores • How to Conquer 5 Persistent Staffing Headaches • Surefire Ways to Make Room Turnover Faster • 10 Everyday OR Challenges — How to Solve Them • And much more...see inside! Presented by "ORX was wonderful, informative, educational, and just plain fun. I can't believe how incredibly nice and welcoming everyone was. Thank you for a truly wonderful experience." 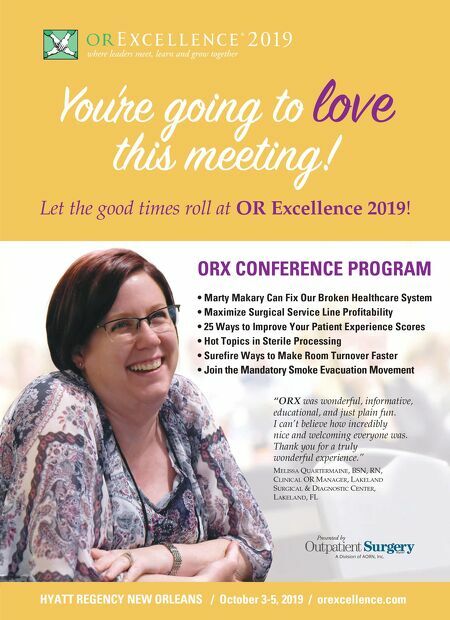 Melissa QuarterMaine, Bsn, rn, CliniCal Or Manager, lakeland surgiCal & diagnOstiC Center, lakeland, Fl Let the good times roll at OR Excellence 2019! You're going to love this meeting!